Where do I use my Appleyard Flowers voucher code? Find the discount you would like to use from NetVoucherCodes. Follow the link through to the Appleyard Flowers website. Find the Bouquet you would like to purchase and add it to your bag. Select the ‘My Bag’ icon at the top of the screen to review your order. Enter your code into the Promotional Code box provided. Apply your discount and follow the steps to complete your order. "Free delivery on selected bouquets." "Enjoy huge savings in the offers section." Appleyard pride themselves in floral designs for around the home, and are constantly on the lookout for new and rare flowers, or trendy colours which appear in their range. Appleyard uses only the finest quality flowers for all seasons, as well as for celebrations such as birthdays, romantic celebrations and plenty of other causes for flowers. You can track the status of your flower or hamper delivery with Appleyard Flowers via their handy tracked delivery service option. If you select this then you will be sent a link to your chosen email address and with details on how you can track your order. Be one step ahead of the game and know for certain when your loved one will receive their surprise gift. Spoil someone you love by sending them beautiful, luxury Flowers through their letterbox - now that is a surprise to come home to. If you think that the recipient might not be at home on the date you want the flowers to arrive, simply check out the Flowers By Post section. From beautiful Red Roses to colourful Calla Lillies, there is a beautiful bouquet ready and waiting for you to order for your loved one, so shop today for Modern Flowers or Designer Flowers and you can even add that extra special touch by adding on an extra gift such as Champagne, Wine or Chocolates. Looking for a beautiful floral gift to be delivered on a Sunday? - then Appleyard Flowers can help. Simply order by 4pm on Saturday and you can get your Flowers delivered on a Sunday. So for those main occasions throughout the year such as Mother's Day or Valentine's Day, then your thoughtful gift can arrive on the exact day required. The beautiful bouquet can arrive with an added extra present such as personalised jewellery. Or maybe a chocolate hamper or food hamper might be the right choice for your special person rather than the scented choice. Whatever you choose, Appleyard Flowers prides themselves on using the highest quality stems to ensure a minimum of 7 days freshness - so look no further when you need top quality flowers delivered any day of the week. To track your order please use the 'track my order' page. How can I contact Appleyard Flowers? To contact Appleyard Flowers please use the contact form. Outside of the peak period, Appleyard Flowers can only amend or cancel an order if requested 2 working days before the delivery date. However, if you request it 1 working day before the delivery date they will do what we can to change it. Appleyard Flowers is the place to head to when you’re looking for luxury flowers for your home or for someone you know, as these flowers will make a fantastic gift to anybody who loves a good bunch in their room. At Appleyard Flowers you’re not just buying a normal bunch of flowers, you’re buying a hand-tied, luxury bouquet. 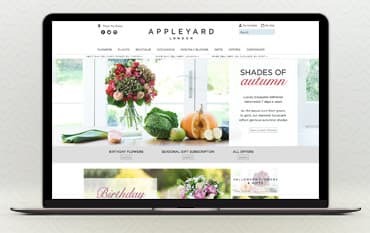 There’s so much on offer at Appleyard that they've made it easy for everybody to shop here, with the ability to shop by range, occasion and type of flower you’ll be sure to find the perfect bunch for less with an Appleyard Flowers Voucher Codes.